FERGUSON, Mo. - Violence broke out again in Ferguson, Mo., a community still reeling from the effects of an unarmed teen gunned down by a white police officer last month. A group smashed up the windows of a beauty supply store, and gunshots could be heard nearby, according to witnesses. No police on scene yet. Young people breaking into Beauty Town. "Burn it down!" one yells. The St. Louis County Police Department told CBS St. Louis affiliate KMOV-TV officers arrived on the scene after a crowd began to gather around 9:00 p.m. County police were assisting the Ferguson Police Department. A crowd gathered near Beauty Town, the store smashed up Tuesday evening, after police arrived. Witnesses said police tried to disburse the group, which was chanting slogans related to the killing of the teen. 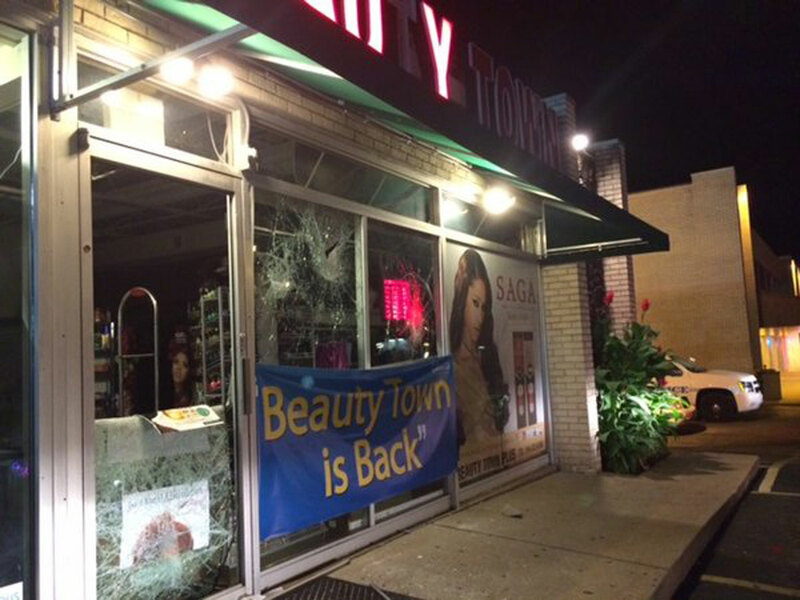 The owner of Beauty Town told a KMOV reporter, "This is the third time we've been hit." He said more than $100,000 in merchandise had been stolen. Authorities told KMOV there had been seven arrests, adding that four officers were hit with rocks and two police cruisers were damaged. Earlier Tuesday, officials announced they were canceling the annual Ferguson Music Festival amid safety concerns, reports KMOV. Before the announcement, a makeshift memorial to Michael Brown, the 18-year-old killed last month, was burned down under still unclear circumstances. Ferguson resident Meldon Moffitt said the fire started around 6:30 a.m. Tuesday on Canfield Drive, the street where Brown was fatally shot Aug. 9 by Ferguson police office Darren Wilson. About two dozen residents gathered at the site Tuesday morning, many of them angry. One man said it was like a grave being desecrated. Many were not willing to believe some reports that candles making up part of the display were responsible for the fire, and told the St. Louis Post-Dispatch they smelled gasoline. "Not one candle can put all the stuff that was up there on fire," one woman told CBS St. Louis. "Come on now. It's too moist out here." Ferguson police spokesman Devin James says the cause of the fire is under investigation. Brown's death led to several days of protests and unrest in Ferguson, a St. Louis suburb. Investigations into the shooting by a state grand jury and the U.S. Department of Justice are ongoing.